Thank you for considering a donation to Fix Ur Cat!!! Fix ur Cat/Low Cost Spay & Neuter Washington County is a not-for-profit 501 C3 volunteer group aimed at the heart of the problem of cat overpopulation – uncontrolled breeding. 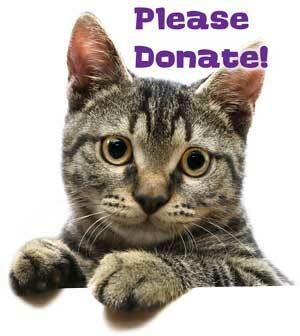 All donations received enable us to assist even more residents with helping to spay and neuter their cats. Cost is $45 to sponsor a spay or neuter. ALL donation amounts are appreciated! Would you like to make a donation in memory of someone or for something specific? Food or Litter? Add your donation note in the “add special instructions” box after you enter your donation amount. It’s that easy! To contribute using Pay Pal click the Donate button below! Other Ways you can help Fix Ur Cat everyday!